I talk to people all the time about cooking, and one of the things I hear over and over is "Well, the reason I don't cook from scratch is because it is too expensive." For some items yes, that can be true, but there are some tricks you can use to save money and maximize the flavor of your dishes. Homemade Chicken Stock is one such way. I know that it sounds intimidating, but it is so easy. And when you see the benefits and cost savings you will be blown away! First you will need to roughly chop your vegetables. There is no need to. You will see why later. Next put them in your stock pot. Now you will rinse your chicken, inside and out. and place in the stock pot. 1.5 hours or longer if you like, flipping the chicken half way through. leftover chicken to make a multitude of recipes throughout the week. and there you have it...homemade stock. However, I like to take mine one step further. or use a fat separator to get rid of any excess fat. and keep it warm while you cook. Now that, ladies and gents, is what I call liquid gold! When you use homemade stock in your dishes, they are full of that little something-something that you only get when it is made-from-scratch! Not to mention your dishes are full of even more love than usual!!! I know what you may be thinking, "That's great and all, but is it really cheaper than buying it?" 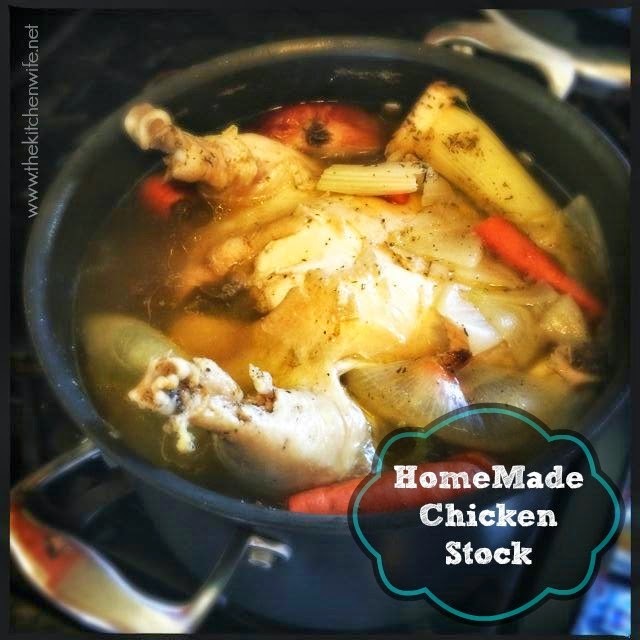 The average box of chicken stock is $2.00. This will give you roughly 4 cups of stock loaded with sodium and preservatives. Not to mention, heaven only knows, what else. Here is the cost break down for my stock. I know what you are saying "SEE, SEE I told you it wasn't cheaper!!" Well, wait just a minute. Remember, the average box of stock is 4 cups. This stock recipe can make at least 24 cups before it STARTS to get a little diluted. (I stopped at 16 because I didn't have anymore room in my pot.) So the average price per 4 cups of stock is $1.20!!! That is AT LEAST an .80 savings on the box and that is if you go with the cheap stuff! If you want to save even more, you don't have to add any vegetables or seasoning. You can just boil chicken and water and you are looking at .84 cents per 4 cups of stock!!! Not only are you saving, but you know what you are putting into your body as well. You control the salt, flavors, everything! Plus, you have all this chicken you can use to make several other recipes with, which is even more savings! PS-I would love to hear from you on FB!!!! Give the carrots and celery a large, rough chop and put in stock pot. Quarter the onion, skin and all, and put in the stock pot. Cut the bulb of garlic in half and put in the stock pot. Rinse the chicken and add to stock pot. Add the salt, pepper, and thyme. Lower to a simmer and let simmer for 1.5 hours. Half way through simmer, flip the chicken. After everything has simmered for 1/5 hours, remove the chicken from the stock pot and set aside to cool. set the colander over a large bowl or pitcher and strain the vegetables from the stock. Skim the fat from the top of stock. Use in your favorite recipe.